Produktinformationen "Physics by Design (EN)"
LEGO® robotics continues to change and grow. This third edition of Physics by Design uses both different hardware and software than the original book, which was written for the RCX and ROBOLAB. However, I hope that the spirit remains the same. More that a decade of teaching Physics by Design has made me more certain than ever that engineering is a powerful tool in K-12 education, one that teaches critical thinking and a deeper understanding of mathematics and science concepts. More importantly, engineering gets kids excited—about science, about math, and about engineering itself. The first students who took Physics by Design are now in college and beyond. It gives me special pleasure that a number of them have gone on to pursue engineering--and have told me that their LEGO physics class started them down that path. 0.5 grams. The students design and build, test and modify, until they are satisfied with their balances. When they decide they are ready, they put their balances to the final test—determining the mass of four unknown objects. These students are doing engineering while at the same time applying what they have learned about center of gravity, stability, and torque. Using the concepts in an actual design project reinforces them more effectively than completing any number of problem sets. In addition, the students have fun building their balances and feel a considerable sense of accomplishment when they successfully complete the challenge. Physics by Design is a project-based course that teaches classical mechanics through engineering. It covers motion, forces, fluids, stability, work, and energy. The topics are approached from an engineering perspective, with building and designing reinforcing the conceptual physics material and vice versa. Most of the designing and building is done using LEGO bricks, including the Mindstorms NXT. All of the students in the course learn programming as well as physics; by the end of the year, they are adept at it. Physics by Design was inspired by the work of the Center for Engineering Education and Outreach at Tufts University. The CEEO is dedicated to bringing engineering into the K-12 classroom. They have had great success in integrating engineering into math and science classes, as well as reading, writing, social studies, and art classes, in schools around the world. I have been lucky enough to work with Professor Chris Rogers and the staff and students at the Center for a number of years. Physics by Design is the most rewarding course I have ever taught. I love seeing the pride that the students feel when they are successful in solving problems and the confidence they gain through the year as they tackle harder design challenges. I love the delight that students feel when they discover a talent for engineering or programming that they never suspected they had. I love that the course lets me be a mentor and a coach, rather than a lecturer and a director. I hope that this book will help other teachers incorporate engineering into their science courses. 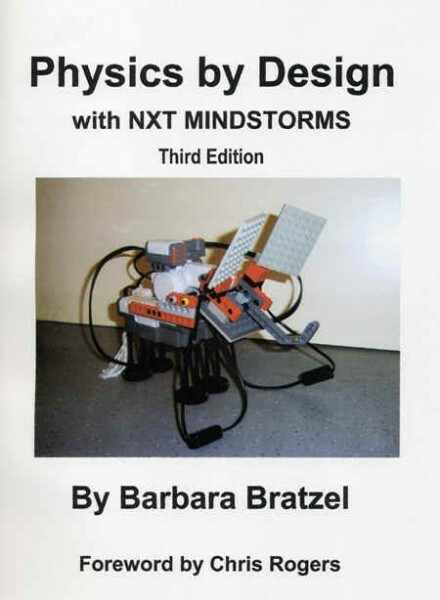 Ten years ago, Barbara was one of the first middle school teachers to embrace the Mindstorms toolset as a teaching tool, resulting in the first edition of this book. Over those ten years, teachers from every continent have started to see robotics and engineering as a powerful motivator for learning. Many have used it to teach "soft" or "life" skills as well as the more conventional academic skills. In her latest edition, Barbara kept much of her previous approach, including checklists for student learning, adapting everything for the recently released NXT Mindstorms platform. She continued to expand on her work, adding more physics and math-based activities and using the new datalogging software. With the new hardware and software, teachers should find it easier to get started in the classroom. When I first saw the prototype of what was to become the RCX, the heart of the LEGO Mindstorms product, it seemed to have an infinite number of possibilities in the classroom. It could take measurements for you; it could control motors, animate constructions, and even talk to another RCX. It seemed to me to be an ideal teaching tool to bring engineering into the pre-college classroom. What was missing is the binder of 50 different experiments for the teacher to use. When the RCX did come out, teachers embraced it, using it to infuse robotics and construction into the curriculum. They came up with many different ways of using it, from after school programs for pre-teens to kindergarten robotics, although most of the published activities were about robotics and vehicles. What is missing is using the RCX as a tool to teach other subjects and that is where this book comes in. It is the physics chapter of that binder. With this book, I hope that teachers will move beyond the robotic animals, cars, and houses and really look at teaching other content through engineering. Barbara was an integral part of the original ROBOLAB design team as an expert “end user.” She tested out different ideas on her middle school students until finally in 1998 she decided to offer a new class, “Physics by Design.” This elective class would be dedicated to letting the students design and build their own experiments using the LEGO bricks as the toolset. The idea was to teach the students how to question, experiment, and answer. In the first year the class was completely oversold and students had to participate in a lottery to get in. Interestingly, the course continues to be filled to capacity despite having a second section, and also has had a strong female contingent, not commonly seen in middle school physics classrooms. Although most of this popularity is due to Barbara’s teaching ability, I think the draw of designing and building (engineering) attracts students because they can see the application, they can use their hands, and actively participate in their learning. In the era of standardized testing, I think we are losing sight of the main goal of education in my mind—to teach students how to learn on their own. We need to teach students how to be curious and ask a question, how to frame the question, how to research the question, how to validate their answer to the question, and how to communicate that answer to others. This has little to do with the content and a lot to do with the approach. Courses like Barbara’s are getting harder to execute because they take longer to cover the topics than does the comparable lecture/memorization course. Standardized tests cannot test learning how to work on a team effectively, learning how to research, and learning how to plan and execute an experiment, yet all of these are, in my opinion, far more important than memorizing scientific fact. With this book, I hope that more teachers will be able to move from memorization and lecturer to investigation and mentor. There is nothing more rewarding than having a group of middle school students come back to the classroom during recess so that they can further investigate the complexities of torque or energy transfer (a common occurrence in Barbara’s class). That is when you know things are going right. Students (of all ages) should be excited to go to school and learn—Barbara has accomplished this and does an excellent job of presenting these ideas in this book. I hope this is the first of many such books from outstanding teachers around the country that emphasize design over memorization. I hope you enjoy taking this into the classroom as much as I have. Weiterführende Links zu "Physics by Design (EN)"
Weitere Info "Physics by Design (EN)"
Kundenbewertungen für "Physics by Design (EN)"